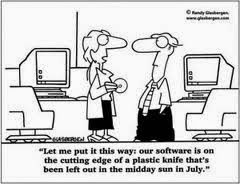 What keeps you up at night when you are in charge of technology delivery for your business? Every company struggles at some point in time. At different periods of growth and contraction, struggle is part of the process. The theory goes that Enterprise Resource Planning (ERP) solutions are designed to integrate the entire business (i.e. the Enterprise). The more this is embraced and the more departments or functional roles that are integrated in your solution the more efficient your operations could be. Okay, makes sense right, purchase an ERP solution, install it, migrate your information, train your people, and start saving lots of money, buy a boat and relax. But what if you already have an ERP solution? What if you have more projects than budget? Where are the savings you thought you were supposed to have? Savings are potentially there, but like a sculptor, you need to uncover them. Where most companies start is inventory. Even small reductions in inventory levels have the potential of improving the bottom line. Small is relative, but think in terms of two to three percentage point drop in levels. Cutting your inventory in half is not realistic. It would cripple your business, but a small drop of a few percentage points is realistic and achievable. The other area that works hand in hand with inventory levels is high accuracy. It is the other side of the coin and cannot be separated. There are several ways to measure accuracy, but most practical is the count. Is what you have on the shelf the same as what you have in your inventory system? How close these two numbers are is a measure of accuracy. The ultimate goal is 100% and that may or may not be realistic, but 97/98% or higher is where you need to be headed. I know of a company that had 100% accurate inventory every month, but only one day a month, once a month. When they did a complete physical inventory count each month, it was accurate, at that time. Then it was off the rest of the month. They did not have an inventory control system. For some companies it is the same or similar story. They only know what they have when they count it or when they do not have it. Out of stock equals zero and that is accurate, but not good when a customer orders it. Their systems have not kept up with their business and the problems have cascaded from there. The Inventory Control module name implies that you will have control of your inventory once you install it. In most places the inventory is in control instead of the other way around. You in fact must trust the system to do what it is designed to do, but that is hard to do when there is no confidence in the system. When that happens people do just about anything to bypass and avoid the very solution that is designed to help. The Inventory Control module is intended to do is give you observability. Warehouse Management Systems (WMS) are designed to monitor the movement of inventory from reception, to put-away, counting, and pick-pack-ship. WMS solutions are usually separate and do incur additional investment, but make sense, because it provides the tools to effectively manage inventory. By monitoring the movement of inventory you do add a level of effort, but the payback is in accuracy and people actually using the system you paid for and depend on. When your workers actually find the inventory the system says should be there in the place it says it should be, then their confidence increases. That increased confidence leads users to use the system more. Most people do not mind using a system that actually works and helps them do their job. Trusting and using the system are critical components to building accuracy. Accuracy is key to driving profitability. With an accurate system, procurement orders the right amount of the correct products. Customer service can accurately answer customer questions and concerns. The Finance department can process transactions and produce financial reporting more quickly and accurately. There are a lot of intricacies of implementing and actually using both an Inventory Control and Warehouse Management System properly. Books have been written on the subject. The purpose of this writing is not to tell you how, but to give you confidence that you can have accurate inventory, you can trust your system and you can generate savings. Any benefit comes after effort. These systems work, if you trust them to do what they are designed to do. Dolvin Consulting works with manufacturers and distributors to help them understand and implement their inventory systems. Contact us today to see how we can help. Please share your success and failure stories here with the rest of our readers. You story counts.